Fusion power is a proposed form of power generation that would generate electricity by using heat from nuclear fusion reactions. In a fusion process, two lighter atomic nuclei combine to form a heavier nucleus, while releasing energy. Devices designed to harness this energy are known as fusion reactors. 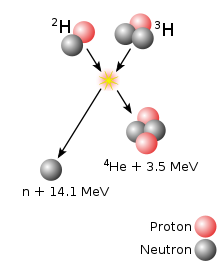 Fusion processes require fuel and a confined environment with sufficient temperature, pressure and confinement interval, to create a plasma in which fusion can occur. In stars, the most common fuel is hydrogen, and gravity creates the conditions needed for fusion energy production. Fusion reactors generally use hydrogen isotopes such as deuterium and tritium, which react more easily, and create a confined plasma of millions of degrees using inertial (laser) or magnetic methods (tokamak and similar), although many other concepts have been attempted. The major challenge in realising fusion power are to engineer a system that can confine the plasma long enough at high enough temperature and density for a long term reaction to occur. A second issue that affects common reactions, is managing neutrons that are released during the reaction, which over time degrade many common materials used within the reaction chamber. As a source of power, nuclear fusion is expected to have several theoretical advantages over fission. These include reduced radioactivity in operation and little high-level nuclear waste, ample fuel supplies, and increased safety. However, achieving the necessary temperature/pressure/duration combination has proven to be difficult to produce in a practical and economical manner. Research into fusion reactors began in the 1940s, but to date, no design has produced more fusion power output than the electrical power input, defeating the purpose. Fusion researchers have investigated various confinement concepts. The early emphasis was on three main systems: z-pinch, stellarator and magnetic mirror. The current leading designs are the tokamak and inertial confinement (ICF) by laser. Both designs are under research at very large scales, most notably the ITER tokamak in France, and the National Ignition Facility laser in the United States. Researchers are also studying other designs that may offer cheaper approaches. Among these alternatives there is increasing interest in magnetized target fusion and inertial electrostatic confinement, stellerator and proton-boron. as a metric of success has impacted other considerations such as cost, size, complexity and efficiency. [dubious – discuss] This has led to larger, more complicated and more expensive machines such as ITER and NIF. Tokamak: the most well-developed and well-funded approach to fusion energy. This method races hot plasma around in a magnetically confined torus, with an internal current. When completed, ITER will be the world's largest tokamak. As of April 2012 an estimated 215 experimental tokamaks were either planned, decommissioned or currently operating (35) worldwide. Spherical tokamak: also known as spherical torus. A variation on the tokamak with a spherical shape. Stellarator: Twisted rings of hot plasma. 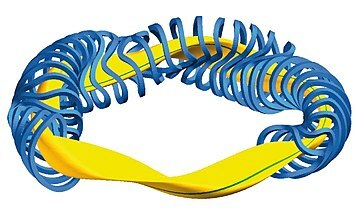 The stellarator attempts to create a natural twisted plasma path, using external magnets, while tokamaks create those magnetic fields using an internal current. Stellarators were developed by Lyman Spitzer in 1950 and have four designs: Torsatron, Heliotron, Heliac and Helias. One example is Wendelstein 7-X, a German fusion device that produced its first plasma on December 10, 2015. It is the world's largest stellarator, designed to investigate the suitability of this type of device for a power station. Heavy Ion Beams There are also proposals to do inertial confinement fusion with ion beams instead of laser beams. The main difference is that the beam has momentum due to mass, whereas lasers do not. Muon-catalyzed fusion: This approach replaces electrons in diatomic molecules of isotopes of hydrogen with muons - far more massive particles with the same electric charge. Their greater mass results in the nuclei getting close enough such that the strong interaction can cause fusion to occur. Currently, muons require more energy to produce than can be obtained from muon-catalyzed fusion. Unless this is solved, muon-catalyzed fusion is impractical for power generation. Gas is heated to form a plasma hot enough to start fusion reactions. A number of heating schemes have been explored: Radiofrequency Heating A radio wave is applied to the plasma, causing it to oscillate. This is basically the same concept as a microwave oven. This is also known as electron cyclotron resonance heating or Dielectric heating. It has been proposed  that steam turbines be used to convert the heat from the fusion chamber into electricity. The heat is transferred into a working fluid that turns into steam, driving electric generators. There are also electrostatic confinement fusion devices. These devices confine ions using electrostatic fields. The best known is the Fusor. This device has a cathode inside an anode wire cage. Positive ions fly towards the negative inner cage, and are heated by the electric field in the process. If they miss the inner cage they can collide and fuse. Ions typically hit the cathode, however, creating prohibitory high conduction losses. Also, fusion rates in fusors are very low because of competing physical effects, such as energy loss in the form of light radiation. Designs have been proposed to avoid the problems associated with the cage, by generating the field using a non-neutral cloud. These include a plasma oscillating device, a magnetically-shielded-grid, a penning trap, the polywell and the F1 cathode driver concept. The technology is relatively immature, however, and many scientific and engineering questions remain. In 1954, Lewis Strauss, then chairman of the United States Atomic Energy Commission (U.S. AEC, forerunner of the U.S. Nuclear Regulatory Commission and the United States Department of Energy) spoke of electricity in the future being "too cheap to meter". Strauss was very likely referring to hydrogen fusion —which was secretly being developed as part of Project Sherwood at the time—but Strauss's statement was interpreted as a promise of very cheap energy from nuclear fission. 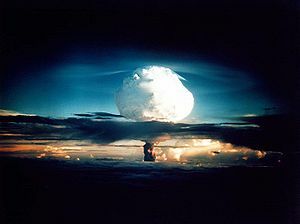 The U.S. AEC itself had issued far more realistic testimony regarding nuclear fission to the U.S. Congress only months before, projecting that "costs can be brought down... [to]... about the same as the cost of electricity from conventional sources..."
The first experiment to achieve controlled thermonuclear fusion was accomplished using Scylla I at the Los Alamos National Laboratory in 1958. Scylla I was a θ-pinch machine, with a cylinder full of deuterium. Electric current shot down the sides of the cylinder. The current made magnetic fields that pinched the plasma, raising temperatures to 15 million degrees Celsius, for long enough that atoms fused and produce neutrons. The sherwood program sponsored a series of Scylla machines at Los Alamos. The program began with 5 researchers and 100,000 in US funding in January 1952. By 1965, a total of 21 million had been spent on the program and staffing never reached above 65. The A.D. Sakharov group constructed the first tokamaks, the most successful being the T-3 and its larger version T-4. T-4 was tested in 1968 in Novosibirsk, producing the world's first quasistationary fusion reaction. When this was first announced, the international community was highly skeptical. A British team was invited to see T-3, however, and after measuring it in depth they released their results that confirmed the Soviet claims. A burst of activity followed as many planned devices were abandoned and new tokamaks were introduced in their place — the C model stellarator, then under construction after many redesigns, was quickly converted to the Symmetrical Tokamak. In 1991 the Preliminary Tritium Experiment at the Joint European Torus in England achieved the world's first controlled release of fusion power. In April 2005, a team from UCLA announced it had devised a way of producing fusion using a machine that "fits on a lab bench", using lithium tantalate to generate enough voltage to smash deuterium atoms together. The process, however, does not generate net power (see Pyroelectric fusion). Such a device would be useful in the same sort of roles as the fusor. In 2006, China's EAST test reactor is completed. This was the first tokamak to use superconducting magnets to generate both the toroidal and poloidal fields. In 2017 Helion Energy's fifth-generation plasma machine went into operation, seeking to achieve plasma density of 20 Tesla and fusion temperatures. In 2018 General Fusion was developing a 70% scale demo system to be completed around 2023. 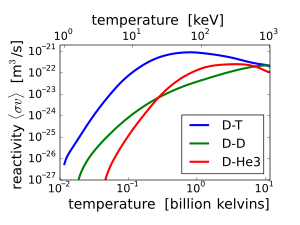 Assuming complete tritium burn-up, the reduction in the fraction of fusion energy carried by neutrons would be only about 18%, so that the primary advantage of the D-D fuel cycle is that tritium breeding would not be required. Other advantages are independence from scarce[dubious – discuss] lithium resources and a somewhat softer neutron spectrum. The disadvantage of D-D compared to D-T is that the energy confinement time (at a given pressure) must be 30 times longer and the power produced (at a given pressure and volume) would be 68 times less. Fusion power could be used in interstellar space where solar energy is not available. ^ "Fission and fusion can yield energy". Hyperphysics.phy-astr.gsu.edu. Retrieved 30 October 2014. ^ a b c Miley, G.H. ; Towner, H.; Ivich, N. (1974-06-17). "SciTech Connect: Fusion cross sections and reactivities". Osti.gov. doi:10.2172/4014032. OSTI 4014032. ^ "Lawson's three criteria". EFDA. February 25, 2013. Archived from the original on 2014-09-11. Retrieved 2014-08-24. ^ "Triple product". EFDA. 2014-06-20. Archived from the original on 2014-09-11. Retrieved 2014-08-24. ^ Fitzpatrick, Richard. "Magnetized plasma". Introduction to Plasma Physics. ^ Tuszewski, M. (1988). "Field reversed configurations". Nuclear Fusion (Submitted manuscript). 28 (11): 2033–2092. doi:10.1088/0029-5515/28/11/008. ^ "Laser Inertial Fusion Energy". Life.llnl.gov. Archived from the original on 2014-09-15. Retrieved 2014-08-24. ^ "The first plasma: the Wendelstein 7-X fusion device is now in operation". www.ipp.mpg.de. ^ a b "Mirror Systems: Fuel Cycles, loss reduction and energy recovery" by Richard F. Post, BNES Nuclear fusion reactor conferences at Culham laboratory, September 1969. ^ Freidberg, Jeffrey P. (8 February 2007). Plasma Physics and Fusion Energy. Cambridge University Press. ISBN 978-0-521-85107-7. ^ a b Nuckolls, John; Wood, Lowell; Thiessen, Albert; Zimmerman, George (1972). "Laser Compression of Matter to Super-High Densities: Thermonuclear (CTR) Applications". Nature. 239 (5368): 139–142. Bibcode:1972Natur.239..139N. doi:10.1038/239139a0. ^ Y. C. Francis Thio Ph.D. "Status of the U. S. program in magneto-inertial fusion" (PDF). Iopscience.iop.org. Retrieved 30 October 2014. ^ a b Seife, Charles. 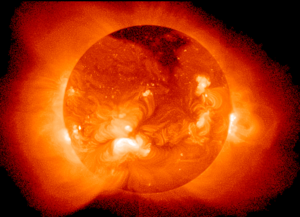 Sun in a Bottle: The Strange History of Fusion and the Science of Wishful Thinking. 1st ed. Vol. 1. N.p. : Penguin, 2008. Print. ^ a b Phillips, James. "Magnetic Fusion." Los Alamos Science Winter 1983: 64-67. Web. 4 Apr. 2013. ^ "The Boy Who Played With Fusion". Popular Science. Retrieved October 18, 2013. ^ "Spherically imploding plasma liners as a standoff driver for MIF" IEEE transactions, 2012, Hsu, et al. ^ Chang, Kenneth (February 27, 2007). "Practical Fusion, or Just a Bubble?". New York Times. Retrieved 2007-02-27. "Dr. Putterman's approach is to use sound waves, called sonofusion or bubble fusion, to expand and collapse tiny bubbles, generating ultrahot temperatures. At temperatures hot enough, atoms can literally fuse and release even more energy than when they split in nuclear fission, now used in nuclear power stations and weapons. Furthermore, fusion is clean[,] in that it does not produce long-lived nuclear waste." ^ Chang, Kenneth (2004-03-25), US will give cold fusion a second look, The New York Times, retrieved 2009-02-08. ^ Ouellette, Jennifer (2011-12-23), Could Starships Use Cold Fusion Propulsion?, Discovery News. ^ Nagamine, Kanetada. "Introductory Muon Science". Cambridge University Press, 2003, Chapter 5. ^ Miley, George H., and S. Krupakar Murali. Inertial electrostatic confinement (IEC) fusion. New York: Springer, 2014. ^ McGuire, Thomas. Heating Plasma for Fusion Power Using Magnetic Field Oscillations. Baker Botts LLP, assignee. Issued: 4/2/14, Patent 14/243,447. N.d. Print. ^ Mott-Smith, H. M. and Langmuir, Irving (1926). "The Theory of Collectors in Gaseous Discharges". Phys. Rev. 28 (4): 727–763. ^ Park, Jaeyoung; Krall, Nicholas A.; Sieck, Paul E.; Offermann, Dustin T.; Skillicorn, Michael; Sanchez, Andrew; Davis, Kevin; Alderson, Eric; Lapenta, Giovanni (2014-06-01). "High Energy Electron Confinement in a Magnetic Cusp Configuration". Physical Review X. 5 (2): 021024. arXiv:1406.0133. Bibcode:2015PhRvX...5b1024P. doi:10.1103/PhysRevX.5.021024. ^ J. Larmor, "On a dynamical theory of the electric and luminiferous medium", Philosophical Transactions of the Royal Society 190, (1897) pp. 205–300 (Third and last in a series of papers with the same name). ^ Seaver, Lynda L (8 November 2010). "Press release: World's largest laser sets records for neutron yield and laser energy". Lawrence Livermore National Laboratory. ^ T. Anklam; A. J. Simon; S. Powers; W. R. Meier (December 2, 2010). "LIFE: The Case for Early Commercialization of Fusion Energy" (PDF). Livermore, LLNL-JRNL-463536. Retrieved 30 October 2014. ^ Cohen, Sam, and B. Berlinger. "Long-pulse Operation of the PFRC-2 Device." The Joint US-Japan Compact Torus. Wisconsin, Madison. 22 Aug. 2016. Lecture. ^ "Fusion energy and why it is important to chase the impossible" Dr. Melanie Windridge, TED x Warwick, April 19th 2018. ^ Wood R D, Hill D N, McLean H S, Hooper E B, Hudson B F, Moller J M, Romero-Talamas C A (2009) “Improved magnetic field generation efficiency and higher temperature spheromak plasmas,” Nuclear Fusion 49, 025001 (4pp). ^ Pfalzner 2006, p. 19–20. ^ Pfalzner 2006, p. 182–193. ^ Thorson, Timothy A. (1996). Ion flow and fusion reactivity characterization of a spherically convergent ion focus. University of Wisconsin, Madison. ^ Cockburn & Ellyard 1981. ^ Cockburn & Ellyard 1981, pp. 52–55. ^ "British Patent 817681". V3.espacenet.com. Retrieved 2013-06-22. ^ "This Day in Quotes: SEPTEMBER 16 – Too cheap to meter: the great nuclear quote debate". This day in quotes. 2009. Retrieved 2009-09-16. ^ David Bodansky (2004). Nuclear Energy: Principles, Practices, and Prospects. Springer. p. 32. ISBN 978-0-387-20778-0. Retrieved 2008-01-31. ^ Nathaniel Fisch. Edward Teller Centennial Symposium. p. 118. Retrieved 30 October 2014. ^ "1964 New York World's Fair 1965 - Attractions - General Electric - Page Eight". www.nywf64.com. Archived from the original on October 30, 2014. ^ Long 1976, p. 25. ^ Booth, William. "Fusion's $372-Million Mothball." Science [New York City] 9 Oct. 1987, Volume 238 ed. : 152-55. Print. ^ Koppel, Niko (May 20, 2010). "Edwin E. Kintner, Nuclear Power Pioneer, Dies at 90". NYTimes.com. Retrieved 2014-08-24. ^ "Dr. Donna Strickland | Science". Uwaterloo.ca. Archived from the original on 2014-01-11. Retrieved 2014-08-24. ^ a b Dr. Matthew McKinzie; Christopher E. Paine (2000). "When peer review fails : The Roots of the National Ignition Facility (NIF) Debacle". National Resources Defense Council. Retrieved 30 October 2014. ^ "Recent Progress on the Los Alamos Aurora ICF (Inertial Confinement Fusion) Laser System." L. A. Rosocha, L. S. Blair, Publication Date, 1987. ^ "Los Alamos National Labs Aurora Laser Fusion Project | Hextek Corp". Hextek.com. 2014-06-20. Archived from the original on May 17, 2014. Retrieved 2014-08-24. ^ Hasegawa, A., Comments on Plasma Physics and Controlled Fusion, 1987, vol. 1, p. 147. ^ "Tore Supra". Archived from the original on November 15, 2012. Retrieved February 3, 2016. ^ Chang, Kenneth (2004-03-25). "US will give cold fusion a second look". The New York Times. Retrieved 2009-02-08. ^ William J. Broad (31 October 1989). "Despite Scorn, Team in Utah Still Seeks Cold-Fusion Clues". The New York Times. pp. C1. ^ "'Cold fusion' rebirth? New evidence for existence of controversial energy source" (Press release). American Chemical Society. Retrieved 30 October 2014. ^ Jarvis, O. N (2006-06-16). "Neutron measurements from the preliminary tritium experiment at JET (invited)". Review of Scientific Instruments. 63 (10): 4511–4516. doi:10.1063/1.1143707. ^ Lindl, John (1995-11-01). "Development of the indirect‐drive approach to inertial confinement fusion and the target physics basis for ignition and gain". Physics of Plasmas. 2 (11): 3933–4024. Bibcode:1995PhPl....2.3933L. doi:10.1063/1.871025. ISSN 1070-664X. ^ Krall, N. A.; Coleman, M.; Maffei, K.; Lovberg, J.; Jacobsen, R.; Bussard, R. W. (1995). "Forming and maintaining a potential well in a quasispherical magnetic trap". Physics of Plasmas 2: 146. ^ "Inertial electrostatic fusion (IEF): A clean energy future" (Microsoft Word document). Energy/Matter Conversion Corporation. Retrieved 2006-12-03. ^ Nevins, William M. "Can Inertial Electrostatic Confinement Work beyond the Ion-ion Collisional Time Scale?" Physics of Plasmas 2.10 (1995): 3804-819. Print. ^ ""IEC Lab Timeline" accessed 1-25-2014". Iec.neep.wisc.edu. Retrieved 30 October 2014. ^ "NSD-GRADEL-FUSION - Neutron Generators". Nsd-fusion.com. Retrieved 2014-08-24. ^ "The IEC star-mode fusion neutron source for NAA--status and next-step designs". Appl Radiat Isot 53 (4-5): 779–83. October 2000. ^ "Fusion nucléaire et striction axiale". Archived from the original on October 4, 2012. Retrieved October 4, 2012. ^ "Output of Sandia Z Accelerator Climbs Closer to Fusion". Sandia.gov. August 1, 1997. Retrieved 2014-08-24. ^ "Another dramatic climb toward fusion conditions for Sandia Z accelerator". Sandia.gov. Retrieved 2014-08-24. ^ "High-Output Sandia Accelerator Able to Predict Nuclear Blast Physics". Sandia.gov. December 2, 1996. Retrieved 2014-08-24. ^ "What is ITER?". Archived from the original on May 27, 2010. Retrieved February 6, 2016. ^ "Fusor Forums • Index page". Fusor.net. Retrieved 2014-08-24. ^ "Build a Nuclear Fusion Reactor? No Problem". Clhsonline.net. 2012-03-23. Archived from the original on 2014-10-30. Retrieved 2014-08-24. ^ Danzico, Matthew (2010-06-23). "Extreme DIY: Building a homemade nuclear reactor in NYC". BBC News. Retrieved 30 October 2014. ^ Schechner, Sam (2008-08-18). "Nuclear Ambitions: Amateur Scientists Get a Reaction From Fusion - WSJ". Online.wsj.com. Archived from the original on 2015-10-11. Retrieved 2014-08-24. ^ "Will's Amateur Science and Engineering: Fusion Reactor's First Light!". Tidbit77.blogspot.com. 2010-02-09. Retrieved 2014-08-24. ^ Taleyarkhan, R. P.; C. D. West; J. S. Cho; R. T. Lahey; Jr. R. Nigmatulin; R. C. Block (2002-03-08). "Evidence for Nuclear Emissions During Acoustic Cavitation". Science. 295 (1868): 1868–73. Bibcode:2002Sci...295.1868T. doi:10.1126/science.1067589. PMID 11884748. Archived from the original on November 6, 2005. Retrieved 2007-05-13. ^ a b Reich, Eugenie Samuel (23 November 2009). "Bubble-fusion scientist debarred from federal funding". Nature. doi:10.1038/news.2009.1103. ^ "The Year in Science: Physics". 2006-10-21. Archived from the original on October 21, 2006. Retrieved 2013-06-22. ^ SirPhilip (posting an e-mail from "RW Bussard") (2006-06-23). "Fusion, eh?". James Randi Educational Foundation forums. Retrieved 2006-12-03. ^ Dutton, Judy. "Teen Nuclear Scientist Fights Terror", CNN.com, September 1, 2011. Retrieved September 3, 2011. ^ "Rock Center: 19-year-old hopes to revolutionize nuclear power". NBC. Retrieved October 18, 2013. ^ TED2013. "Taylor Wilson: My radical plan for small nuclear fission reactors". TED.com. Retrieved May 6, 2013. ^ May, Kate Torgovnick (February 27, 2013). "Good energy comes in small packages: Taylor Wilson at TED2013". TED blog — Science. TED (conference). Retrieved 2014-02-10. ^ "President Obama Hosts the White House Science Fair". The White House. Retrieved October 18, 2013. ^ What is NIF?, Lawrence Livermore National Laboratory. ^ a b Clery, Daniel (2014-07-25). "Fusion's restless pioneers". Science. 345 (6195): 370–375. doi:10.1126/science.345.6195.370. ISSN 0036-8075. PMID 25061186. ^ a b c Frochtzwajg, Jonathan. "The secretive, billionaire-backed plans to harness fusion". Retrieved 2017-08-21. ^ Kanellos, Michael. "Hollywood, Silicon Valley and Russia Join Forces on Nuclear Fusion". Forbes. Retrieved 2017-08-21. ^ Gray, Richard. "The British reality TV star building a fusion reactor". Retrieved 2017-08-21. ^ Seaver, Lynda L. (2010-10-01). "World's largest laser sets records for neutron yield and laser energy". Lawrence Livermore National Laboratory. Retrieved 2013-06-22. ^ "First successful integrated experiment at National Ignition Facility announced". General Physics. PhysOrg.com. October 8, 2010. Retrieved 2010-10-09. ^ SPIE Europe Ltd. "PW 2012: fusion laser on track for 2012 burn". Optics.org. Retrieved 2013-06-22. 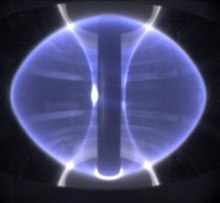 ^ "Nuclear fusion milestone passed at US lab". BBC News. Retrieved 30 October 2014. ^ Kramer, David (2006-06-16). "Livermore ends LIFE". Physics Today. 67 (4): 26–27. doi:10.1063/PT.3.2344. ^ "The Alectryon High Yield Neutron Generator". Phoenix Nuclear Labs. 2013. ^ "FuseNet: The European Fusion Education Network". Fusenet.eu. Retrieved 30 October 2014. ^ "Fusion Power Could Happen Sooner Than You Think". Popular Science. Popular Science. 2013. Retrieved 30 October 2014. ^ "Nuclear fusion energy in a decade? Lockheed Martin is betting on it". Washington Post. 2014-10-15. Retrieved 30 October 2014. ^ a b Wang, Brian (August 1, 2018). "Nuclear Fusion Updated project reviews". www.nextbigfuture.com. Retrieved 2018-08-03. ^ Chandler, David L. (10 August 2015). "A small, modular, efficient fusion plant". MIT News. MIT News Office. ^ "Wendelstein W7-X starting its experimental journey". Germany: ipp.mpg.de. ^ Clery, Daniel (2017-04-28). "Private fusion machines aim to beat massive global effort". Science. 356 (6336): 360–361. doi:10.1126/science.356.6336.360. ISSN 0036-8075. PMID 28450588. ^ Gibbs, W. Wayt (2016). "The Fusion Underground". Scientific American. 315 (5): 38–45. Bibcode:2016SciAm.315e..38G. doi:10.1038/scientificamerican1116-38. PMID 27918497. ^ "Italy's Eni defies sceptics, may up stake in nuclear fusion project". Reuters. 13 April 2018. ^ "MIT Aims to Harness Fusion Power Within 15 years". 3 April 2018. ^ "MIT Aims To Bring Nuclear Fusion To The Market In 10 Years". 9 March 2018. ^ "MIT and newly formed company launch novel approach to fusion power". 9 March 2018. ^ Atzeni, Stefano; Meyer-ter-Vehn, Jürgen (3 June 2004). The Physics of Inertial Fusion: BeamPlasma Interaction, Hydrodynamics, Hot Dense Matter. OUP Oxford. pp. 12–13. ISBN 978-0-19-152405-9. ^ "Thinkquest: D-T reaction". Retrieved 12 June 2010. ^ Iiyoshi, A; H. Momota; O Motojima; et al. (October 1993). "Innovative Energy Production in Fusion Reactors". National Institute for Fusion Science NIFS: 2–3. Retrieved 14 February 2012. ^ "Nuclear Fusion Power, Assessing fusion power". World-nuclear.org. Retrieved 30 October 2014. ^ Rolfe, A. C. (1999). "Remote Handling JET Experience" (PDF). Nuclear Energy. 38 (5): 6. ISSN 0140-4067. Retrieved 10 April 2012. ^ M. Sawan, S. Zinkle, and J. Sheffield, Fusion Eng Des 61-2, 561 (2002). ^ "Nuclear Fusion: Laser-Beam Experiment Yields Exciting Results". LiveScience.com. ^ "Record proton-boron fusion rate achieved - FuseNet". www.fusenet.eu. ^ Evans, Ll. M.; Margetts, L.; Casalegno, V.; Lever, L. M.; Bushell, J.; Lowe, T.; Wallwork, A.; Young, P.; Lindemann, A. (2015-05-28). "Transient thermal finite element analysis of CFC–Cu ITER monoblock using X-ray tomography data". Fusion Engineering and Design. 100: 100–111. doi:10.1016/j.fusengdes.2015.04.048. ^ Evans, Ll. M.; Margetts, L.; Casalegno, V.; Leonard, F.; Lowe, T.; Lee, P. D.; Schmidt, M.; Mummery, P. M. (2014-06-01). "Thermal characterisation of ceramic/metal joining techniques for fusion applications using X-ray tomography". Fusion Engineering and Design. 89 (6): 826–836. doi:10.1016/j.fusengdes.2014.05.002. ^ Dulon, Krista (2012). "Who is afraid of ITER?". iter.org. Retrieved 18 August 2012. ^ a b McCracken, Garry; Stott, Peter (8 June 2012). Fusion: The Energy of the Universe. Academic Press. pp. 198–199. ISBN 978-0-12-384656-3. Retrieved 18 August 2012. ^ Angelo, Joseph A. (30 November 2004). Nuclear Technology. Greenwood Publishing Group. p. 474. ISBN 978-1-57356-336-9. Retrieved 18 August 2012. ^ a b T. Hamacher; A.M. Bradshaw (October 2001). "Fusion as a Future Power Source: Recent Achievements and Prospects" (PDF). World Energy Council. Archived from the original (PDF) on 2004-05-06. ^ "Interim Summary Report on the Analysis of the 19 September 2008 Incident at the LHC" (PDF). CERN. ^ Peterson, Tom. "Explain it in 60 seconds: Magnet Quench". Symmetry Magazine. Fermilab/SLAC. Retrieved 15 February 2013. ^ Petrangeli, Gianni (1 January 2006). Nuclear Safety. Butterworth-Heinemann. p. 430. ISBN 978-0-7506-6723-4. ^ Markandya, Anil; Wilkinson, Paul (2007). "Electricity generation and health". The Lancet. 370. pp. 979–990. ^ a b c d R. J. Goldston, A. Glaser, A. F. Ross: "Proliferation Risks of Fusion Energy: Clandestine Production, Covert Production, and Breakout";9th IAEA Technical Meeting on Fusion Power Plant Safety (accessible at no cost, 2013) and Glaser, A.; Goldston, R. J. (2012). "Proliferation risks of magnetic fusion energy: Clandestine production, covert production and breakout". Nuclear Fusion. 52 (4): 043004. Bibcode:2012NucFu..52d3004G. doi:10.1088/0029-5515/52/4/043004. ^ "Energy for Future Centuries" (PDF). Archived from the original (PDF) on 2011-07-27. Retrieved 2013-06-22. ^ Eric Christian; et al. "Cosmicopia". NASA. Retrieved 2009-03-20. ^ Fusion For Energy. "Fusion For Energy - Bringing the power of the sun to earth". f4e.europa.eu. ^ "The current EU research programme" (PDF). FP6. Tab Beim Bundestag (tab.fzk.de). Retrieved 30 October 2014. ^ "The Sixth Framework Programme in brief" (PDF). ec.europa.eu. Retrieved 30 October 2014. ^ Grossman, Lev (November 2, 2015). "Star power". Time. ^ Robert F. Heeter; et al. "Conventional Fusion FAQ Section 2/11 (Energy) Part 2/5 (Environmental)". Fused.web.llnl.gov. Archived from the original on 3 March 2001. Retrieved 30 October 2014. ^ Frank J. Stadermann. 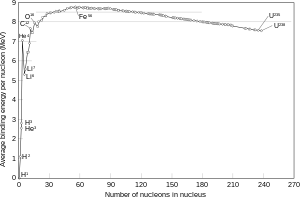 "Relative Abundances of Stable Isotopes". Laboratory for Space Sciences, Washington University in St. Louis. Archived from the original on 2011-07-20. ^ J. Ongena; G. Van Oost. "Energy for Future Centuries" (PDF). Laboratorium voor Plasmafysica– Laboratoire de Physique des Plasmas Koninklijke Militaire School– École Royale Militaire; Laboratorium voor Natuurkunde, Universiteit Gent. pp. Section III.B. and Table VI. Archived from the original (PDF) on 2011-07-27. ^ EPS Executive Committee. "The importance of European fusion energy research". The European Physical Society. Archived from the original on 2008-10-08. ^ Sing Lee; Sor Heoh Saw. "Nuclear Fusion Energy-Mankind's Giant Step Forward" (PDF). HPlasmafocus.net. Retrieved 30 October 2014. ^ "What Is The Future Of Space Travel?". Zidbits. Retrieved 14 November 2015. Cockburn, Stewart; Ellyard, David (1981). Oliphant, the life and times of Sir Mark Oliphant. Axiom Books. ISBN 9780959416404. Huizenga, John Robert (1993). Cold Fusion: The Scientific Fiasco of the Century. Oxford University Press. ISBN 978-0-19-855817-0. Nagamine, Kanetada (2003). "Muon Catalyzed Fusion". Introductory Muon Science. Cambridge University Press. ISBN 978-0-521-03820-1.